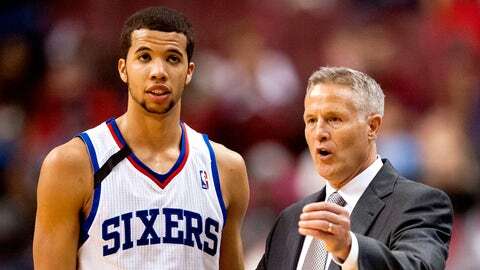 76ers head coach Brett Brown says he'll be patient with Michael Carter-Williams as he recovers from an infection. Philadephia 76ers point guard Michael Carter-Williams might be the frontrunner for NBA Rookie of the Year, but his campaign hit a speed bump when he was sidelined with a knee infection that landed him in the hospital. He was released Sunday after three days at the University of Pennsylvania facility and rejoined the team, out of uniform, for Monday night’s 94-83 loss to the Clippers. And according to coach Brett Brown, there’s no timetable for his return. "Really — and it’s boring but it’s all I know — it’s day-to-day. You know what I know. He’ll travel with us. We’ll continue to monitor him. We will obviously err on the side of being smart and cautious with him, but he’s back with us," Brown told USA Today. Teammate Thaddeus Young was happy to have Carter-Williams back, too. Just so long as the rookie kept his distance. "I seen his leg and I was like, ‘Man, what is that?’ It was like all swollen and red and stuff like that. I was like, ‘You might need to go get that checked out.’ And he was like, ‘I did get it checked out.’ I was like, ‘You might need to get another opinion or something,’ Young, whose locker is next to Carter-Williams, told USA Today. "I didn’t touch his leg. I definitely moved over to the next seat, though. I definitely wanted to know what it was." When the rookie left the team, he was averaging 17.5 points, 5.8 rebounds and 7.3 assists per game and had just notched his first career triple-double in a win over the Orlando Magic. He also came up one steal shy of a triple double in his NBA debut, leading the Sixers to a win over the Miami Heat, and took home Eastern Conference Player of the Week on the opening week.